The small gesture from my son that changed how I look at him. My son is Autistic. He is also nonverbal. He is without speech, he lacks social skills, he does not lack emotions. When someone cannot talk, it’s easy to assume that he has no feelings either. Not being able to express is not the same as not being able to sense. My son has very often been a victim of this assumption. I’ve been a culprit. Every once in awhile I catch myself discussing my son with someone, in his presence, as if he is a non-entity in the room . He cannot talk, so he does not have an opinion. That’s what we tend to incorrectly believe . A seemingly insignificant incident helped shatter this myth , yet again. It was a routine drop-off at his bus stop in the morning when something happened that changed how I look at my son. The weather was pleasant after a cold spell and everyone wanted to feel the sun and the warmth. So, unlike a bleak winter day , today there were a bunch of kids playing around, having fun. I did not really think much about it. Afterall they were just little children, not someone my son would be interested in playing with. But then, I saw something different happen this time. I noticed my son watch them with longing and delight. I had not seen that interest in his eyes before. He could not tell me but I knew immediately that he wanted to play with them. “Why isn’t the bus here yet”, I thought to myself. I had read stories about how kids reject a “different “ kid. I was not ready for a heartbreak this early in the morning on such a beautiful day. Not another one. However, seeing my son’s excitement, I groggily asked if he wanted to join them and he shrieked a huge yes. I was still apprehensive. He could not talk and make friends. He could not tell them how much he wanted to be a part of that group right now. This was a perfect recipe for disappointment . By now I knew better than to put on those rosy glasses. Still, I walked him to the kids, stopped a few of them , prompted my son to say “hi!” and then requested them if they would let him play .They knew he was ,umm.. .different but I still dropped in a line about the same. They shrugged the way only kids can and still look cute doing it and then resumed what they were doing. I left my son there and moved away, hoping he would know what to do next. He didn’t. 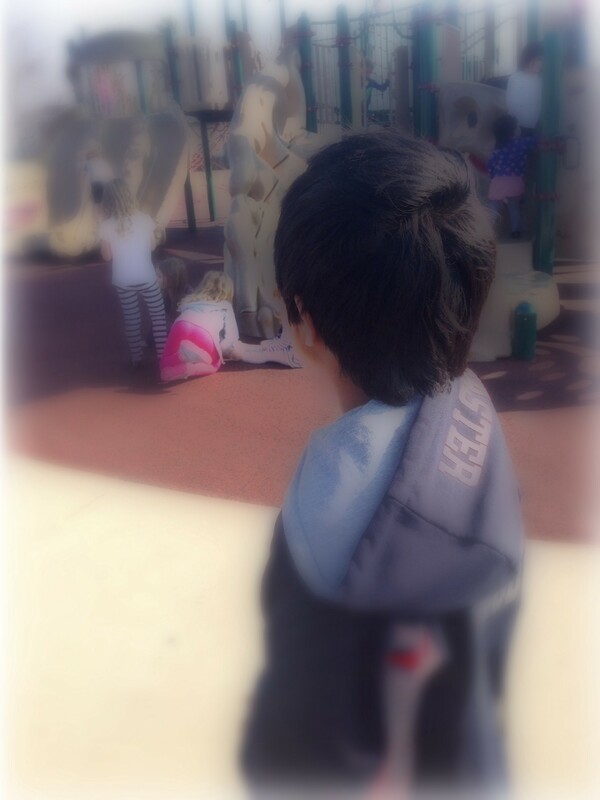 He stood there, watching the kids play all around him but not with him. It almost felt like he was invisible to them. I watched him stand there confused, rejected and ignored and I wondered if this was the microcosm of his future. But then something interesting happened. He came to me, grabbed my hand , pulled me towards the kids and said “mumma come”. Apparently he had not given up on people. He just needed me by his side, to help him, guide him and be his friend even when no one else is. We both walked back to noisy group and mingled in. We didn’t fit in but we didn’t give up. My son’s autism makes him struggle socially, but as I stood there in that bus stop, I wondered who was more socially awkward. Even as my heart broke as I watched all this unfold in front of me, I was filled with hope. In that brief moment my son and I shared a promise of a lifetime. Him being nonverbal might have changed how others perceived him and treated him but I understood every word he wanted to say and every emotion he went through in that fleeting moment. My son may not talk but he has feelings and I would do everything in my power to make sure they are acknowledged just as much as anyone else’s out there. The world is not going to change with just marches, ribbons and bumper stickers. It’s going to change with a conversation -a conversation about inclusion and respect that every home on this planet needs to have. Until that happens, the world is going to be that bus stop for my child and for every other child who is different but not less. Unless we learn to see beyond the obvious we will never be able to see the beautiful world that lies in the eyes of people who have a heart but no words. Originally published at www.braindroplets.com on February 21, 2017.